A sci-fi thriller that drags more than it soars, Interstellar finds director Christopher Nolan favouring spectacle over substance. Cooper (Matthew McConaughey), a former astronaut-turned-farmer, is struggling to survive on a ravaged Earth. When a last-ditch attempt to save mankind presents itself, Cooper leaves his family behind for the outer reaches of space. Overstuffed with exposition and scientific vernacular that’s spewed out incomprehensibly, Interstellar suffers under the weight of its lofty concept. The visuals are admittedly astounding, with the lustrous, interminable recesses of space nicely contrasted with the dusty, finite remains of Earth. Nolan’s talent behind the camera blooms with every film. Yet underneath, where it counts, there’s very little for audiences to chew on. The script squanders fleshed out characters and humanity for claptrap and an all or nothing ending. There’s a father-daughter relationship in there somewhere, but it’s soon brushed off in favour of more eye catching novelty. 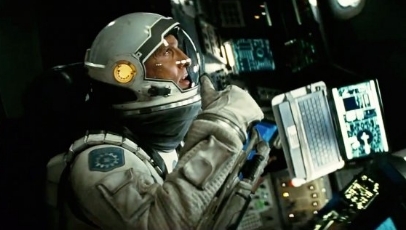 In terms of performances, McConaughey is passable as our hero and family man, while his co-stars – including Anne Hathaway as fellow astronaut Amelia and Jessica Chastain as his deserted daughter Murph – are left hanging in the balance. For all of its wonder, Interstellar is nothing more than beautiful scenery: lots of dazzling set pieces strung together with as little understandable content as possible.